Whether you are a homeowner purchasing a brand new home or remodeling an existing home, the process of choosing flooring materials can be overwhelming. Options seem endless, which makes the process both fun and challenging at the same time. It may be helpful to know why tile materials are usually the best choice when considering new flooring. Below is a summary of the most common flooring products and how they compare to porcelain tile. Tile Versus Carpet: The advantage of carpet is the sense of warmth and sound absorption it brings to a room. Carpet can have several disadvantages, none of which are concerns with tile installations. Allergens. Some people are sensitive to the dust carpet can collect and/or the fiber the carpet is fabricated from. Cleanings are typically required every 1 to 1 1/2 years to maintain the manufacturer’s warranty. Carpet cleanings can be costly depending on the square yardage installed. Carpet can be stain resistant, but it isn’t stain proof. Depending on the spill, it could be a permanent stain. If the carpet is not continuous filament, it will fuzz and shed over time. All carpet will mat down over time as the fibers become compressed from foot traffic. Tile Versus Hardwood: With the advent of wood look tiles, many consumers are now selecting wood look tiles instead of hardwood flooring. The advantage of hardwood flooring is the natural variation in each plank of wood. Disadvantages include the following. Hardwood flooring will dent and scratch, which may mean it is not a viable option for active households that have pets and/or children. Hardwood flooring is not ideal in locations that have a potential for termites. Hardwood flooring can expand when subjected to water or moisture. Hardwood flooring may require periodic refinishing depending on traffic and furniture usage. Laminate wood flooring is more scratch resistant than hardwood flooring, but scratching can still occur. Additionally, because laminate wood is installed using a floating installation it is typically more noisy than tile or hardwood floors. Expansion from moisture is also still a possibility. Wood look tiles have a variety of lengths and widths. Often, the same series will be available in multiple widths that can be mixed together to simulate a natural hardwood floor. Available styles include everything from rustic and textured planks to contemporary and smooth finishes that are easy to maintain. Tile Versus Vinyl: Sheet vinyl and vinyl tiles (resilient flooring) come in a variety of colors and patterns, although there is typically less variety than what is available in porcelain tiles. An advantage of vinyl flooring is the softness which can be helpful for individuals with difficulty standing for long periods of time. Disadvantages include the following. One disadvantage of vinyl materials is their durability level. Vinyl can scratch and tear. Care is required when moving appliances, chairs and other furniture, etc. Vinyl does not perform well when installed over concrete control joints – it can tear along these locations. Tile, when used in conjunction with a flexible membrane and a proper installation, will allow for flexibility over a concrete control joint and when installed over a concrete crack. 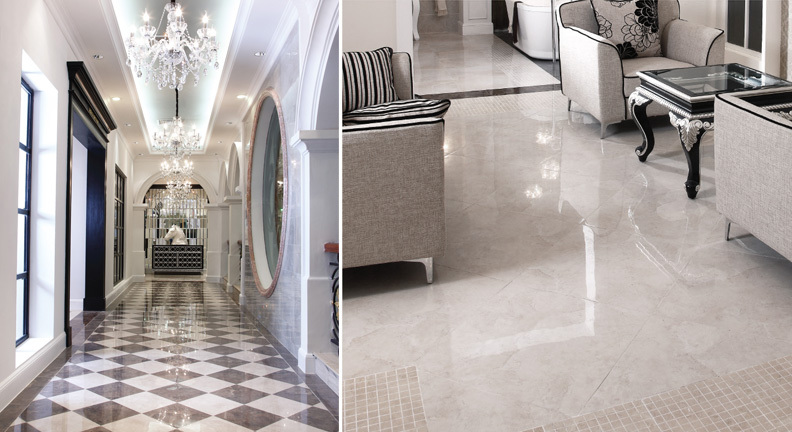 When comparing tile to other common flooring materials, it’s clear that tile is a wonderful choice due to its affordability, durability, and variety.